Today on the PLD website we respond to a recent enquiry we received on the research that underpins the PLD range of teaching resources. The post contains information on and links to some of the research and resources that is the basis of the three step PLD Literacy approach. The resources behind PLD. Dear Diana, I am a Kindergarten teacher and I have been using your resources throughout the year and have been very pleased with the results. There are others in the K -3 section of the school who would like to put the programme into our school but we have found it difficult to get admin on side. Can you give me more details about the research on which the programme is based so that we can use it to support our request.Thank you for your assistance. 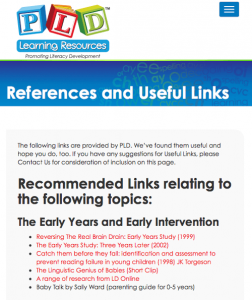 Please refer to the useful links section within our website devoted to the research that underpins the PLD Teaching resources range. Some of the research is in the form of direct links which will make it very easy for you to access it. Also is a reference list which requires a university library to access. I hope this helps in establishing more current research based programs and initiatives in your school.